LibrePlanet 2015 is coming! We're excited to announce that next year's conference will be held March 21-22, 2015 in Cambridge, MA. The Free Software Foundation is teaming up with the Student Information Processing Board at MIT once again to bring you a conference you won't want to miss. Our Call for Sessions is open now, and you can also apply to volunteer or exhibit at LibrePlanet 2015. General registration will open in October. You've got until Sunday, November 2nd, 2014 at 19:59 EST (23:59 UTC) to submit your proposals. We can't wait to see what you come up with! This year, the theme of LibrePlanet is "Free Software Everywhere." We're looking for talks that touch on the many places and ways that free software is used around the world, as well as ways to make free software ubiquitous. Think "everywhere" in the broadest sense of the word--it's not just geography-based talks we're after. What are some contexts where free software is thriving, and some others where it needs a push? How have you worked to advance free software in your company or community? And what about free software on all of the myriad pieces of hardware we use, including laptops, phones, tablets, and even coffee makers? At LibrePlanet 2015, we're taking software freedom around the world, to outer space, and considering its role in industry, government, academia, community organizing, and personal computing. Should I submit a session proposal for LibrePlanet? Yes! We encourage speakers of all experience levels to submit a proposal. LibrePlanet is a great place for new and seasoned speakers alike. While LibrePlanet always includes technical talks, our program also emphasizes non-technical topics and topics that are appropriate for newcomers. We are especially interested to see proposals from people who use free software or apply its values for social benefit, from academic research to community organizing, education to medicine and the arts. LibrePlanet is committed to increasing the participation of speakers belonging to groups traditionally underrepresented at free software conferences, including women and people of color. At LibrePlanet, we are looking for sessions that embrace the free software movement's ideals and also its language. For example, using "free software" is better than using "open source." LibrePlanet depends on volunteer support during the planning process all the way through the event. We're looking for volunteers who want to help us with the planning and preparation work for LibrePlanet. Learn more about volunteering and sign up at LibrePlanet.org. LibrePlanet is the perfect place to spread the word about your organization to an inspired and engaged audience. We have two kinds of promotional opportunities for LibrePlanet 2015: exhibit tables and sponsorships. Exhibit tables will be located in a highly visible primary thoroughfare. Your table and program acknowledgement will reach hundreds of software developers, free software activists, academics, students, and computer users. You can apply for an exhibit table at LibrePlanet.org. Exhibitors will be accepted on a rolling basis until the hall fills, so apply early! What makes LibrePlanet so special is the amazing contributions from our speakers, exhibitors, and volunteers. We can't wait to hear your ideas! 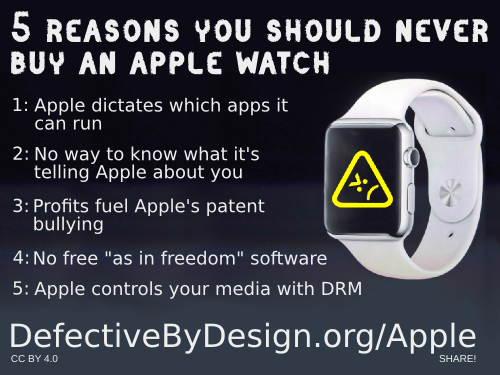 Fight the hype: share this image on your networks today, while the Apple Watch and iPhone 6 are in the news cycle. Unlike Apple, we don't have millions to burn on commercials (we tried to get U2 to play for us but they said no). But we can build a movement for digital freedom and self-determination from the ground up. We need to use tools like this image to show our friends and communities -- and Apple -- that we know what these devices are really all about: control. PS - With the support of the Free Software Foundation, developers are bringing the free software mobile operating system Replicant to more devices all the time. See the list of currently supported devices or help the project expand it with a donation for more test devices. You can read this post online at https://www.defectivebydesign.org/node/2329. You can unsubscribe from this mailing list by visiting the link https://crm.fsf.org/civicrm/mailing/unsubscribe?reset=1&jid=130939&qid=9192625&h=6f9a31225a244219.